How do people cook dainty meals? Meals so light and and…and like there’s a wisp of food on the plate? A teeny little morsel to savor for an instant? I, alas, am not capable of such things. 2 large purple Eggplants, peeled and sliced thinly **I used a mandoline to create thin, even slices. If using a knife make sure your slices are thin and flexible, ok? 1 large container Ricotta (I think it’s the 2lb. size) **I prefer Polly-o’s flavor, if you’re not using fresh. If you can get it – fresh ricotta is AMAZING! 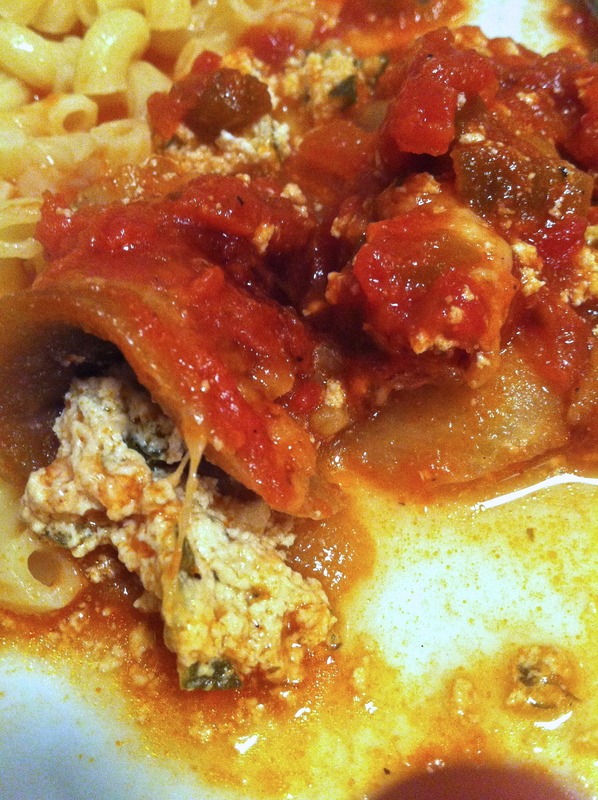 1 1/2 jars of Red Sauce **Tonight I used Vittorio’s Marinara Sauce. Feel free to make your own. 1 lb. block of Fresh Mozzarella, sliced thinly or chopped into pieces **Alternatively, use pre-shredded. It might make your life easier. 2- Lay your eggplant slices out on double layers of paper towel and salt well. Leave for 30 minutes to let the bitterness leech out of them. Take a paper towel and wipe the slices clean, rinsing (and then drying) if necessary to remove all the salt. 3- In a mixing bowl dump your ricotta, egg, parsley, garlic powder, pepper and parmesan. Mix to incorporate. 4- Grab your big casserole dish. 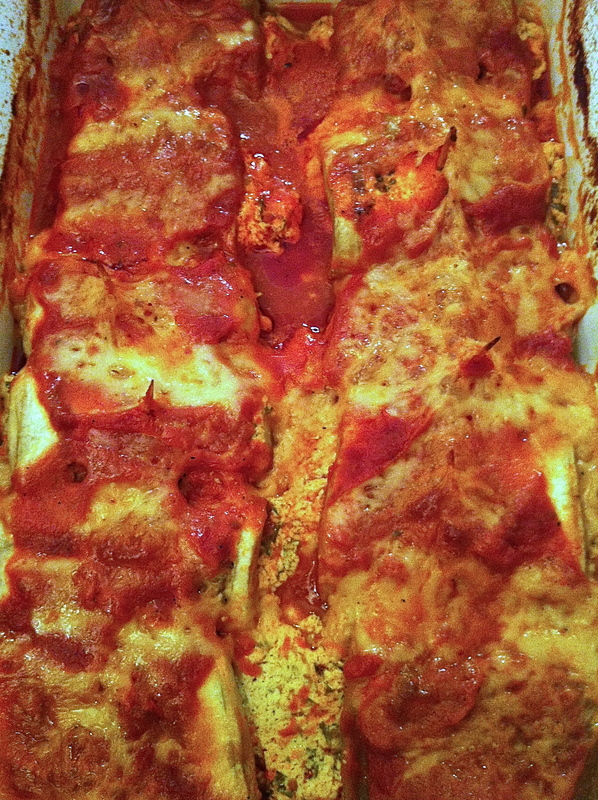 It’s rolling time – you’re going to scoop 1 heaping Tablespoon of the ricotta mix onto one end of one eggplant slice. Now you’re gonna roll the slice up and secure it with a toothpick. Lay this in the casserole dish. Repeat until all your slices are rolled. If you need to, grab another casserole dish for your overflow. 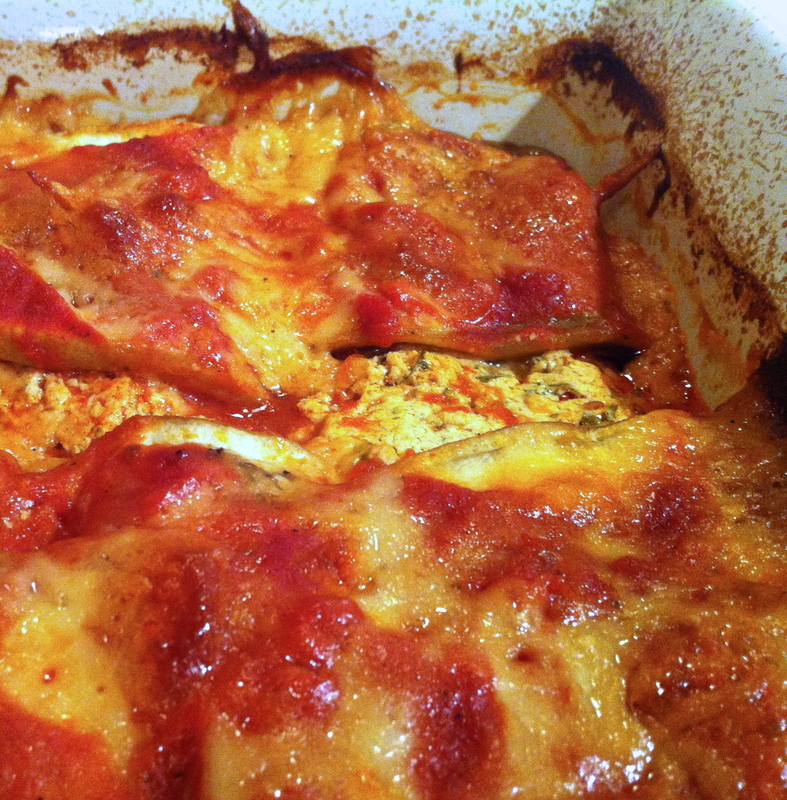 5- Pour your sauce over the eggplant rolls and top with your cheese. 6- Cover with foil and whack your pan in the oven. Set the alarm for 1 hour. 7- After an hour, uncover the pans (watch out for the steam!) and leave them to brown up on top for another 20 minutes or so. Serve over buttered pasta and/or with a nice salad. End result: I had seconds. J ate the filling outta his rollatini and R demanded THIRDS of her pasta. C liked it, but was a little wary of eating too much red sauce. I’m looking forward to leftovers tomorrow…and the next day…and probably the three days after that too. 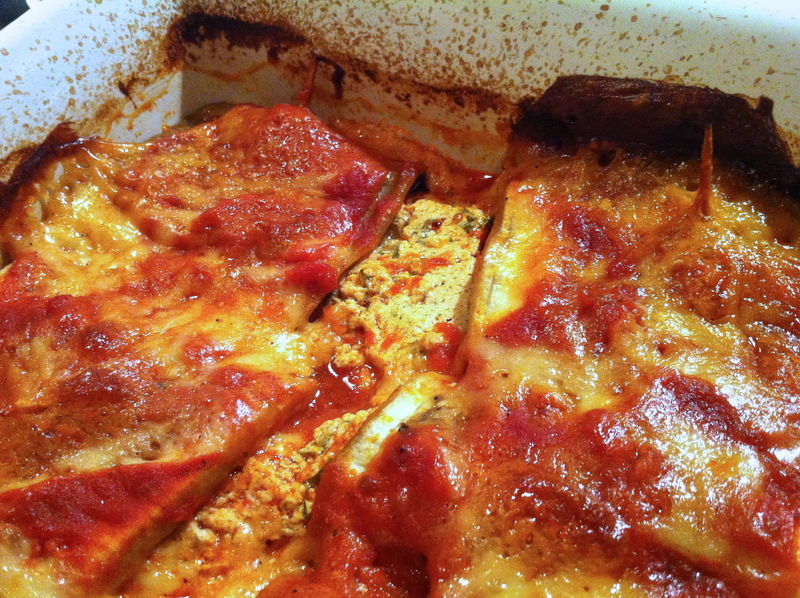 Oh, and I also don’t seem capable of reading like EVERY recipe for Eggplant Rollatini in existence. I didn’t pre-cook my eggplant (by breading and frying or baking or grilling or roasting). Maybe next time I will…We’ll see. Maybe I’ll remember.